When you learn to drive with Drivemark Driving School, your driving lessons are tailored to suit YOU! So training is done at a pace that best suits your needs. This I find helps me maintain the HIGH FIRST TIME PASS RATE that will give you the best chance of passing "FIRST TIME". Finding a driving instructor can be a daunting task. 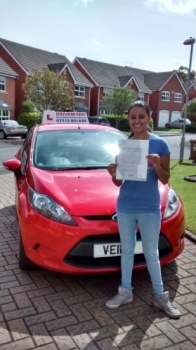 First you’re driving instructor must be an Approved Driving Instructor (ADI). We believe it’s really important to be taught how to drive safely right from the beginning, bad habits are hard to break! Approved Driving instructors such as ourselves are specially trained to teach you what you need to know to be safe and competent on the road. We have lots of experience and knowledge about driving, which we can use to help you become a confident, safe driver. At Drivemark Driving School we are proud of our good reputation and long list of satisfied customers, take a look at our "Passers" page. We are often complimented on our punctuality and excellent communication with our pupils. We also are signed up to the ADI Driving instructor code of practice, which is a guarantee of our commitment high quality teaching practises. Hopefully these assurances will give you the reason to choose Drivemark Driving School to teach you to drive. Get in touch now and book your lessons with DRIVEMARK DRIVING SCHOOL.